In my last post about our launch of Balance Redefined, I wrote about the importance of building a group fitness calendar that includes stand-alone balance classes. Now I want to address how your community can move beyond the classes on the calendar to build a wrap-around fall prevention program. Partnerships: Therapy, home health and nursing staff are invited to observe a balance class to aid in resident referrals for those who could benefit. Many of the therapy teams we partner with will provide patients with a handout of exercises to continue upon discharge from their services with additional instructions to participate in the balance class. Our staff are involved in the discharge plan and participate in a hand off of a resident from their therapy regimen to a preventive program in the fitness center. Assessments: Using the Fullerton Advance Balance Test protocols in conjunction with the Senior Fitness Test, we assess how a resident’s vestibular, somatosensory, and/or visual senses impact their balance. Based on the results, we prescribe specific exercises to improve specific areas of weakness. 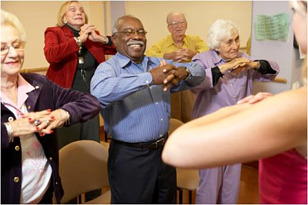 We believe strongly that working with residents to identify the underlying cause of a balance deficiency opens the door to further educating and empowering the individual on a path to improved well-being both emotionally and physically. Education: Empowering residents through education and resources on fall prevention is key to improving confidence and helping residents identify the services best suited to their needs. NIFS offers an array of educational programs ranging from fall prevention lectures partnered with the therapy department, to seminars on coaching residents how to fall safely or get up from the ground, as well as signs/symptoms to look for with concussions and the long-term impact one can have on a senior’s stability. Balance Fairs: Think Health Fair with a creative twist to showcase everything balance and fall prevention related! This collaborative effort taps into internal and external partners to communicate services and resources for residents. Examples of vendors for the fair include an assistive device tune-up clinic from rehab, a balance assessments from the fitness staff, a "balance your plate" booth from dining services, a local podiatry practice educating on proper footwear, the community pharmacist speaking about medication side effects, internal clinic/health services offering blood pressure screenings, a local chiropractor providing posture checks, and more. This may be a unique approach for your community, and if you don't have adequate fitness staff in place, it could seem like a heavy lift. If you need to rally your staff around the concept, forward on this blog to start the conversation, or download our quick read on the importance of balance training. 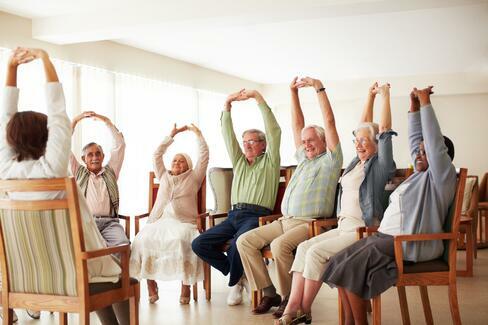 With services ranging from fun balance circuits to balance sessions using the Wii Fit or Biodex Balance System to aquatic balance programs, prospects will quickly see how much more your community offers. Based on the consulting work I've done with communities across the US, this is a comprehensive, prevention-based approach that helps our clients stand out from their competition. 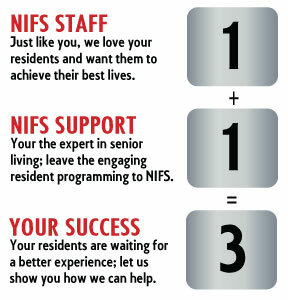 If you want to find out more about how to bring NIFS and Balance Redefined to your residents, connect with us. Stand on the street and ask 100 random people their feelings about going to school as a child and you will get 100 different answers. If I were asked my response would have sounded something like this, “I just want to graduate and get a job so I can be done with homework and live the easy life like adults.” I’m shaking my head as I write this, but that is how I truly felt back then. No matter whom you are certain days in school were destined to be fun, and those days were when we had a SUBSTITUTE. Well today I am going to be that sub, except I won’t be in a classroom with books, I will be on a track with kettle bells, plyo boxes, and resistance bands; I’m subbing for an outdoor boot camp class. Personally I love to cover other instructor’s classes, because I am guaranteed to encounter something different. The something different part is what we should all look for no matter our profession, new experiences break the monotony of our every day schedules and will positively affect our brain function. As I’m preparing for class my mind is racing and I love it, what music should I play, I wonder how many people will come, how fit are they, what if they can’t do an exercise, what if we don’t have enough equipment? Are just a few of the questions racing through my mind, but instructing the class and facing those questions gives me the opportunity to hone my skills, meet new people, travel to new places, and hopefully become a better instructor for the classes I already have, and for those I will sub for in the future. I hope the same benefits I receive from instructing a new class is passed on to the class I am leading. Any fitness professional will tell you to vary your workouts to reduce boredom and to aid physiological changes. Well nothing will change things up for a group fitness program like being led by a different instructor. No matter how similar two instructors are, there will always be some differences, for example a different cadence will require a higher level of mental focus so that you can stay in sync with the instructor. Often people who have been working with the same instructor for long periods of time can go into “auto-pilot” or turn their brain off during class because they are so familiar with the routine that their body just moves without much thought as to what they are doing. This blog is not meant for just group fitness instructors and exercise class goers, it’s meant for everyone. Break your everyday cycle and try something different. It will affect an area in your life positively. For all my class goers: when that sub does walk through the door, don’t pout, your instructor will be back, but in the mean time act like a kid again, let all that energy out and have a great class, after all it’s only a sub! 1. Visit them when they first move in to the community. In order to be sure they have the time to ask questions and really consider becoming a member of the fitness center, I go to visit each new resident within a few weeks of their move-in date. I want to give them time to get settled, but not so much time that they’ve filled their schedule with other things. During that visit, I’ll take about 10-15 minutes to explain all of the fitness offerings and programming we have within our community. I usually end up staying twice that amount of time because, once they hear about our awesome program, many of the residents have questions about how to join or about how they can benefit from the fitness center. It’s also a great time to start building some rapport with each person as an individual. Rather than just becoming “that exercise leader” to them, you can have a relationship with each person individually and really make them feel like they will be missed if they don’t participate. After working in this field for a while, each person starts to develop their own system for keeping members committed. One of my most successful practices is simply in making appointments with new members. People of all ages are much more likely to show up if they have an appointment and feel like they will let someone down if they don’t keep it. I try to use that to my advantage when keeping new members engaged. When new members turn in their health history form and waiver, I set up an orientation appointment with them. 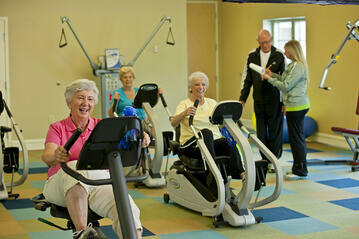 At their orientation appointment, I typically recommend a few group fitness classes and set up a senior fitness test. 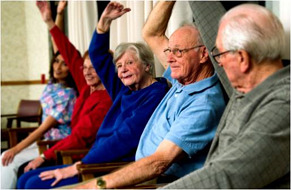 At the senior fitness test, I make an appointment for an exercise prescription. By that time, they have met with me and come to classes anywhere from 5-10 times and they have begun to build a habit. It’s a simple, but effective way of getting them into the fitness center enough times that they begin to see a benefit from exercising. 3. Sell your group fitness classes. This one won’t work for every potential member, but I can tell you that it works for most people who come into our fitness center. Group fitness is one of the hottest things we have going here. 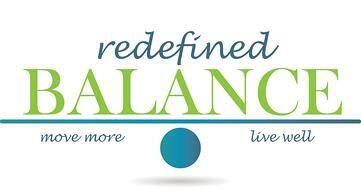 Residents will miss out on all sorts of other events if they are scheduled during our Balance Class. I believe there are several reasons for this. First of all, it’s a social activity. We have anywhere from 10 to 30 people come to Balance Class on a regular basis so it’s a great place to meet up with people and to meet new people. Second, they feel missed if they aren’t there. I try to make it a point to talk directly to at least one different person in class each day. Ask them how their day is going or how their grandkids are. I believe building these relationships is important because then they’ll know we miss them if they aren’t there. Third, and perhaps most importantly, they feel the benefits! I can’t tell you how many residents have come up and told me how much they can tell when they miss a few classes. I aim to give them a good workout every day so that they can keep their independence and this is what really keeps them coming back for more. What are some successes you've had getting new residents involved in fitness programs?